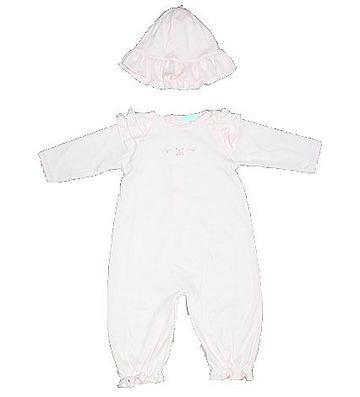 This pink outfit is perfect for infant children as it can be a gown for night time feedings and can snap up to be a pantset. The light pink gown has a flowery design on the chest and three rows of ruffles on each shoulder. There is a decorative trim on the wrists and ruffles on the hem. The snaps on the back is easy to get on/off and a matching light pink hat. This super soft outfit is 100% pima cotton.